Hazelnut milk was a first for me- it worked wonders in a smoothie and the chocolate was a favorite of Justin's ....although he is partial to anything chocolate. Because of the strength of Hazelnut’s flavor, it’s recommended for use in baking and coffee applications, but can overpower savory applications. 3 ingredients- YES, only three! 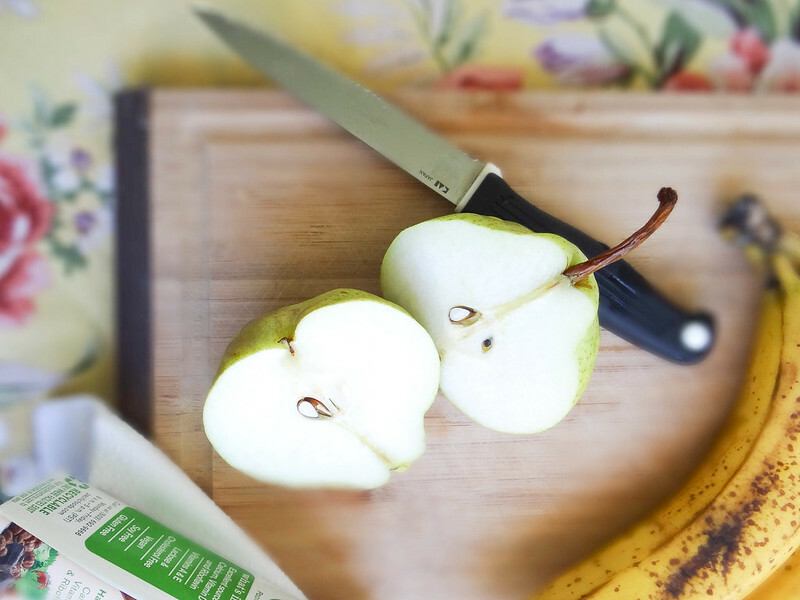 Makes this a quick & easy smoothie that you should totally add to your morning routine. I was in love with the first sip and and thought to myself, yep, I now have a new morning addiction. 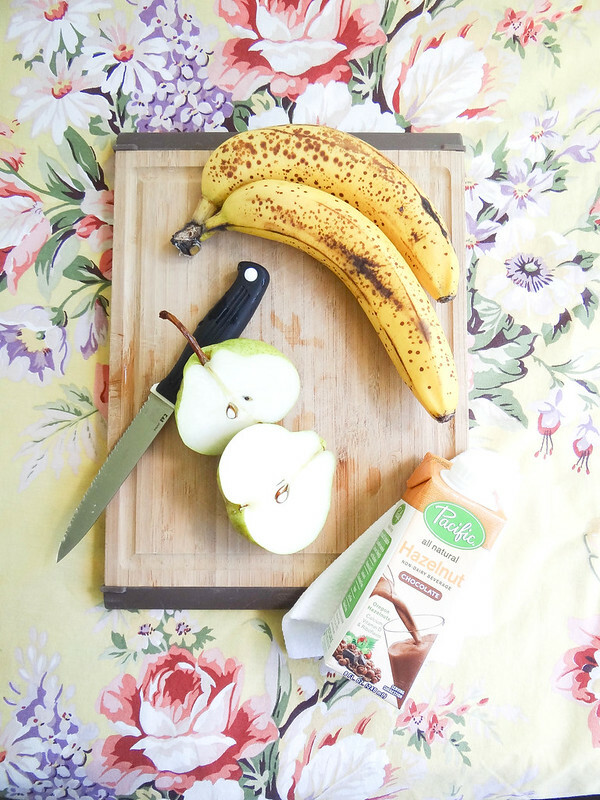 As you know from my last post I have a special place in my heart for pears, add chocolate and we're partners for life. 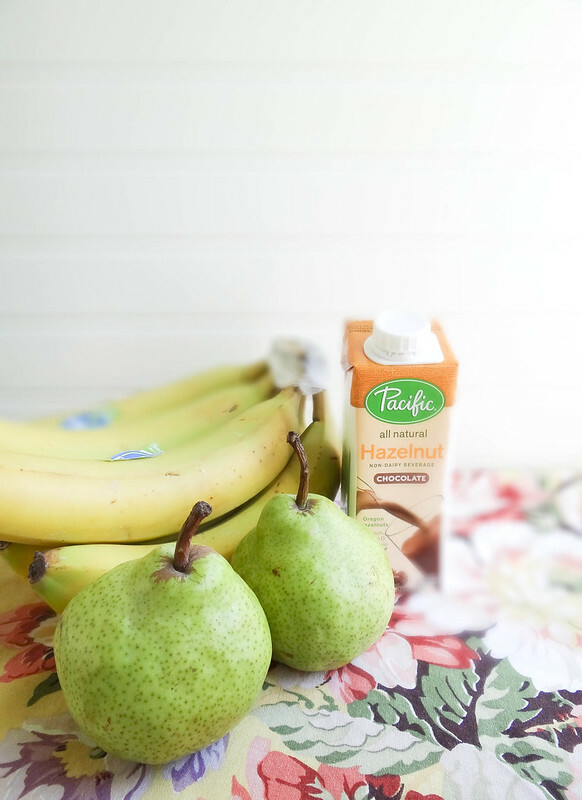 Funny, I had never thought to add pears to a smoothie but it just seemed right paired up with the chocolate hazelnut milk. 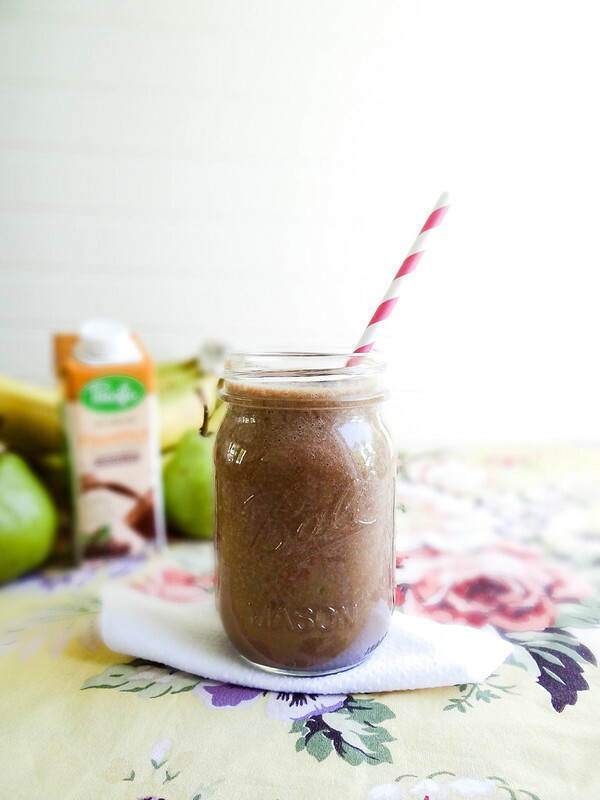 The banana adds body to the overall smoothie and a little sweetness. What is the most unexpected smoothie combination that you made and loved? Don't forget to tag your non dairy creations with #nondairymonth - we LOVE seeing your creativity in the kitchen and if you make this smoothie and wanna share your creation with us on instagram tag it with #smbp! BONUS! 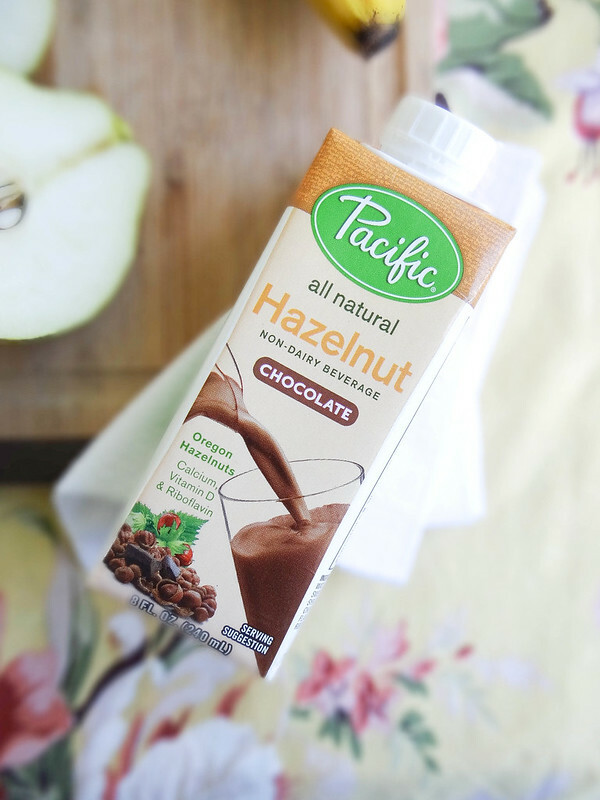 Pacific would like to share the tastiness of Hazelnut Milk with you by giving one lucky reader a case of Chocolate Hazelnut Milk- how awesome is that! In a blender or food processor, blend fruit until smooth. Add chocolate hazelnut milk and blend well. 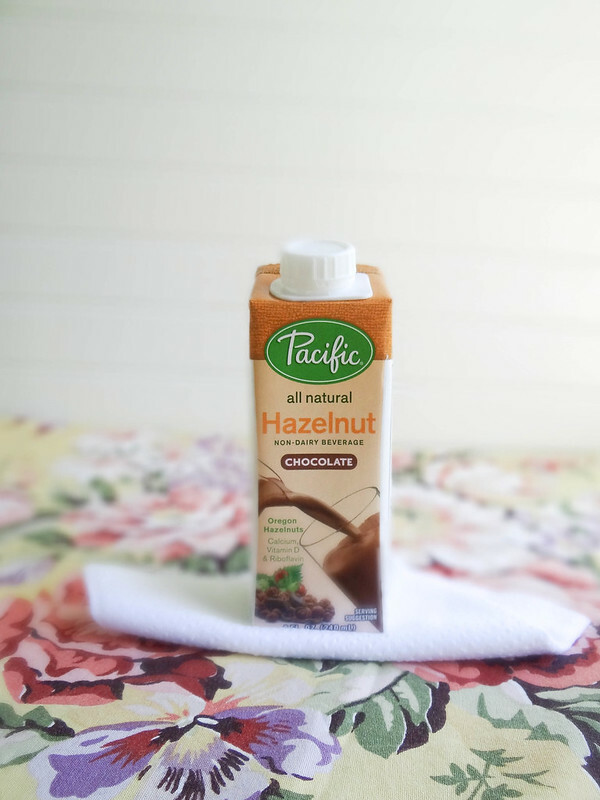 Pour into a glass and top with cacao nibs. Love trying different non-dairy milks. This looks so delicious Heather! Love the look of it! Hi Heather, I just wanted to let you know that your post photos aren't coming up on Bloglovin. I'm not sure if you've ever looked at Bloglovin (it's an RSS feed app that people can use online and on mobiles) for some reason it's taking your Pin It button as the picture. So you might lose some followers who "eat with their eyes" first. THANK YOU so much for letting me know- I just changed my Pin it Button format to a Hover Button, I think this should fix the problem for future posts! 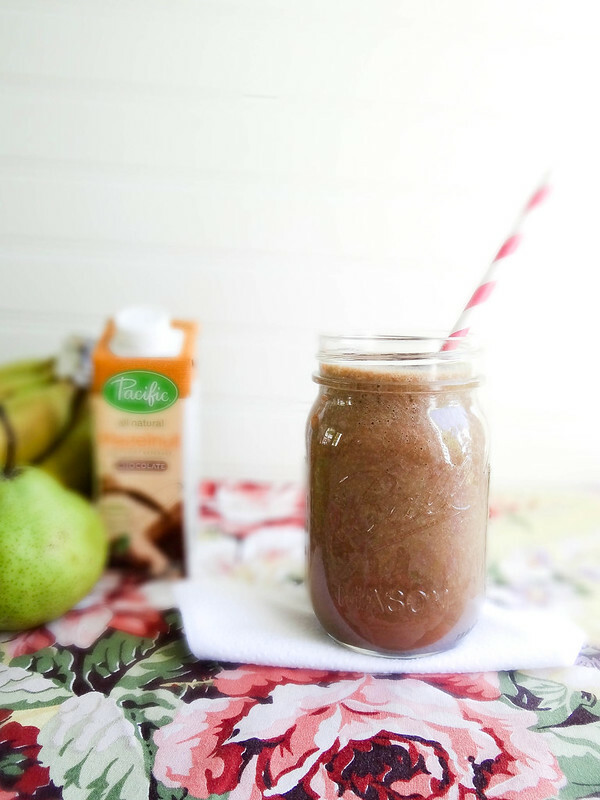 My favorite cake is a dark chocolate, hazelnut and pear cake, so I know I'll love this smoothie! Oh man that sounds amazing! Almond butter and banana--also delicious with peanut butter or some added chocolate or coffee flavor! 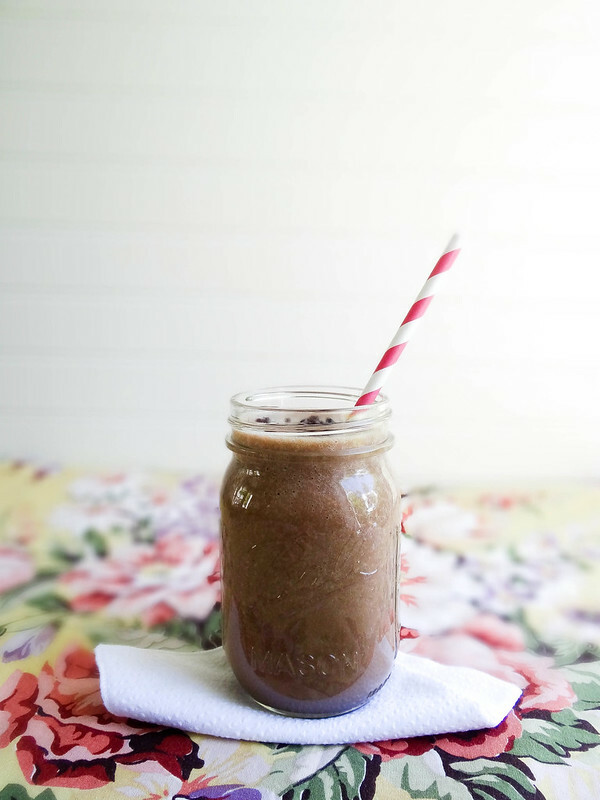 Ours is super simple--chocolate almond milk, frozen banana, flax meal, and pb. Sometimes, we'll add spinach. This sounds so good! I'd love to try hazelnut! Love smoothies with banana and yogurt. I love peanut butter banana smoothies. I usually go with a banana strawberry smoothie with a few greens and maple syrup. Mmmm... I need some smoothie! Banana with chocolate, peanut butter, non-dairy milk and a little stevia. I love mixing different fruits like banana, orange and strawberry together with some almond milk and a touch of sweetener. My favorite smoothie right now is banana, peanut butter, spinach, and almond milk. My favorite is a green smoothie with chocolate protein powder! This looks sooooo good. I was so skeptical the first time I tried a green smoothie, but was surprised that the taste of spinach really does disappear just like everyone says it does. How about that? ;) I could use a change from the usual banana-berry-spinach combo, though. Hmm that's tough, I don't do too many smoothies but the standard banana peanut butter is always a favorite, and anything cake batter flavored would be awesome though I've yet to recreate that! This sounds like a nutella smoothie, yum! Love this! Looks so good! So happy I found your blog! 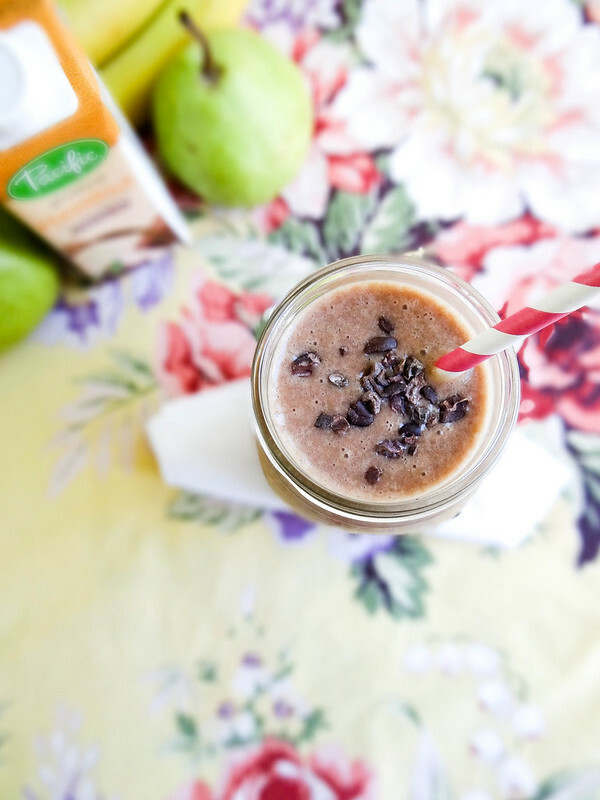 My favorite smoothie is what I call an "avocolada": avocado, pineapple, coconut meat, vanilla extract, hemp protein, and fresh apple juice or nut milk! Sometimes I throw in some spinach, too! I really enjoy making green smoothies. Mine usually have spinach, berries, almond milk and protein powder in them. I would have it for breakfast daily! My father-in-law began working on a family tree a few years ago. He began digging into family records and getting names and dates from family members.